All ribbons and garlands were given. When the 2nd KAAHC Championship closed on late Friday afternoon with a celebration of spirit after honoring the Arabian horse with an ECAHO A show for three days. Though the KAAHC Championship is much more than just another show. The event is hosted by the King Abdulaziz Arabian Horse Center (KAAHC) in Dirab, whose patronage King Abdul Aziz Bin Abdul Rahman Al-Saud greatly respected the Arabian horse for his strength, beauty, and purity. The KAAHC was established under the supervision of the Ministry of Agriculture and is the official authority for all Arabian Horse matters in Saudi-Arabia. Continuous support of the Government and the Royal Family, the KAAHC is dedicated to preserving the heritage of the Arabian horses in its homeland. The championships saw newcomers and well-known horses. Let’s start with the seniors where two elegant chestnuts accomplished champion honours. The senior stallion championship was exciting and the decision close. Just one point difference was between Al Khalediah Stud’s Gold Champion Marquis CAHR, by Marwan Al Shaqab and his Silver winning paternal half-brother, Abha Qatar. In addition, Marquis CAHR sired the Bronze winner Razi Al Kahlediah. So all winners tracing back to double World Champion Marwan Al Shaqab respectively the reigning Platinum World Champion Stallion Gazal Al Shaqab. Delight’s Divah RB, her name says it all. 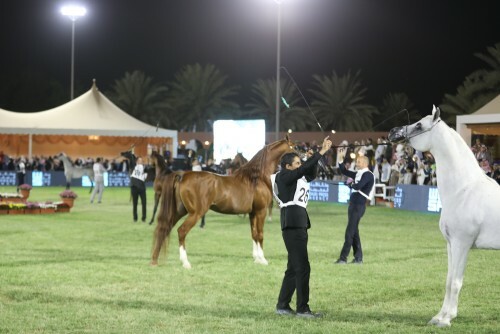 This fabulous chestnut mare by Ajman Moniscione achieved Gold Champion Senior Mare for Al Sayed Stud and it was a clear decision with eight points difference. Fleabitten Norma, by Gazal Al Shaqab, garnered Silver while the DA Vinci FM daughter Duchess of Davinci accomplished Bronze. Marwan Al Shaqab not only dominated the senior championships but the yearlings, too. The yearling filly medallists’ are all tracing back to him. 2016 Unanimous Gold World Champion Senior Stallion EKS Alihandro, by Marwan Al Shaqab, is the proud sire of Gold Champion Yearling Filly Rshediah Alkhashab and Bronze Champion Ebaa Athbah, while Silver went to the Kahil Al Shaqab (by Marwan Al Shaqab) daughter Haifa ED. Similar results could be seen with the yearling colts. Gold Champion Yearling Colts was Hilal Al Khalediah, by Baanderos out of Halah Al Khalediah, so inbred to Marwan Al Shaqab. Aforementioned Abha Qatar is the sire of Silver winner Mishaal AM and Bronze winning Ghazal LNJ II’s dam Gazals Couture is by Gazal Al Shaqab. The international judge's panel gave a clear vote for Venice MI and awarded Gold Champion Junior Filly to this fine Allegiance MI daughter, proudly owned by Al Muawd Stud. The filly represents the Padron Psyche sire line, just like Silver winning Mawada Al Khaled, whose sire Glorius Apal is linebred to Padron Psyche. Kanz Albidayer is the sire of Bronze winner Mayar IV, so we can see the influence of Marwan Al Shaqab again, this time through Kanz Albidayer’s dam DL Marielle. Though the sire line traces back to WH Justice – Magnum Psyche and Padron Psyche. And the junior colts? The results featured a similar picture to the yearlings – Marwan Al Shaqab everywhere. 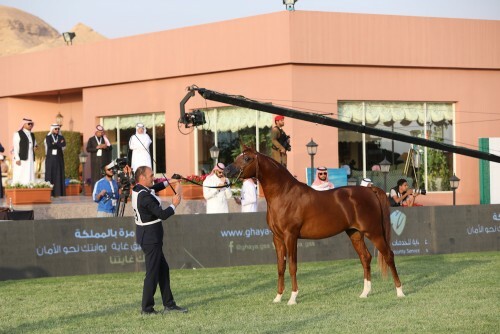 Athbah Stud’s EKS Alihandro son Gabel Athbah took away Gold Champion Junior Colt. The Silver winner, Imhotep Rach, came all the way from South America to Saudi-Arabia and represents the Marwan Al Shaqab line through his sire RHR Marcedes. Zaher Al Muawd garnered Bronze; he is a son of reigning Silver World Champion Senior Stallion Equator, by QR Marc – Marwan Al Shaqab. We wish to thank the King Abdulaziz Arabian Horse Center for hosting KAAHC Championship in Dirab and for partnering with Arabian Horse Results.